Pitti Uomo 2018 celebrated flannel, used above all to realize trousers destined to be the trendiest item in Fall/Winter 2018-19. Research, quality and, at the same time, tradition are the primary elements. However, the keyword for next season will be comfort. Thus, the major part would be played by soft and wearable trousers better suited to men’s style. Soft lines and forms reminiscent of Hollywood stars were the center of trouser models proposed by the brand Pence 1979 designed by Dora Zecchin. High waist trousers will become fashionable once again, worn with belts that will substitute braces, made of classic fabrics starting from the timeless pinstripe. And then wool, flannel and ribbed velvet. PT Pantaloni Torino, on the other hand, abandoned the tradition and the excess of classicism to get inspired by the Surrealist Movement. The focus is, thus, on jacquard fabrics with animal prints, elongated fit carrot, darts and linings taking inspiration from Magritte. Trousers are also enriched with details that remind us of Dalì such as, for example, a melted watch peeking out from a pocket, or golden buttons reproducing a tiger’s head. The new line realized by P Paoloni proposed three models to satisfy any kind of man: regular model, for those who love the classic way; slim model for a contemporary man; and the baggy model for a futuristic look. The variety of models proposed allows you to go from the most formal looks to the sportswear version, and to the most informal and urban moments with a jogging pants model. Moreover, the wearability of the baggy model offers a total relax, with the use of natural or stretch materials, even though wool is still the prevailing material together with corduroy and cotton blend fabrics. 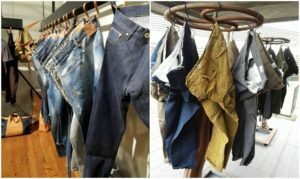 For next Winter, Siviglia has proposed 5 pocket trousers but also different models such as chino, sport and sartorial versions.